Depart from your Playa del Carmen hotel in a comfortable and air-conditioned minivan to begin your exhilarating expedition. Sit back and admire the picturesque scenery as you nibble on pastries and sip aromatic coffee, then listen as your guide offers insight into the geology and ecology of the Yucatan peninsula. Arrive at the atmospheric Xenotes Oasis Maya, a new park operated by Experiencias Xcaret, and commence your journey to the four stunning cenotes, each one of which represents a different element. Engross yourself in your guide’s fascinating explanation of how the cenotes were used by Mayans for sacrificial and spiritual purposes as you admire the luscious greenery and unique sounds of the jungle. Approach the first ‘fire’ cenote and jump into a comfortable kayak to explore the mysterious waters. Paddle around the perimeter to enjoy the gorgeous surrounding scenery and the mystical ambience within the sinkhole. Re-energize after each cenote with an indulgent champurrado, a traditional chocolate-based drink, and cookies for a revitalizing snack. 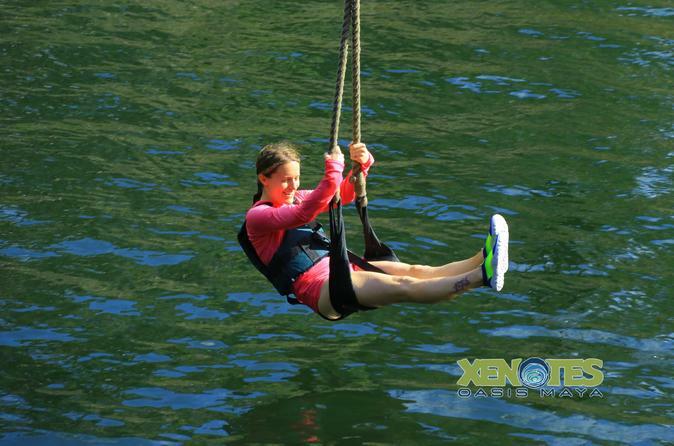 Next, don your protective gear and clip yourself in to enjoy the ride of your life over the second ‘wind’ cenote. Soar over the sparkling pool on your high velocity zip line before plunging into the clear water surrounded by crumpling limestone walls for an invigorating dip. Listen to the powerful rush of fast flowing rivers as you rappel down the walls of the third ‘earth’ cenote to the inviting waters below; watch streams meander through the twisting tunnels and deep caves as you descend to the subterranean depths. 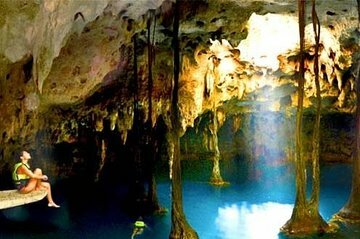 See, too, the final ‘water’ cenote, a fascinating formation complete with rugged rock formations and diverse wildlife. Don your snorkel and submerge yourself in the refreshing waters to discover water-lily gardens and colorful fish in this harmonious underwater wonderland. Enjoy a delicious picnic lunch during a stop on the return journey to your hotel; treat your taste buds to fusilli-vegetable soup, a premium selection of cheeses and deli meats, and rustic breads and fresh salads. Sip complimentary drinks such as coffee, wine, beer and water throughout your lunch then settle in for the short trip back to your Playa del Carmen hotel.